A Royal History | Edmonton Royal Rubber Stamp Co.
For the better part of a year, Royal Rubber Stamp & Sign Co. has been undergoing renovations to our main branch just north of downtown Edmonton. During this time, I have stumbled upon all kinds of photos and memorabilia from Royal's proud and storied history. I figured I would take this opportunity to share some of my finds as they not only show a unique look back at Royal's past, but also offer a glimpse into Edmonton's history. This is a Royal history. Enjoy! The stamp handle was a signature of Royal Rubber Stamp's vehicles from the 1960's to the late 2000's. This photo dates back to 1982! Do you remember seeing the "stamp" driving around the streets of Edmonton? Before TSN 1260 was TSN 1260, it was TEAM 1260. Before that? CFRN 1260, a soft rock station. In the 1980's, Royal had some radio ads produced by CFRN 1260 and we still have them on cassettes! Now all we need is a tape player so we can listen to them. 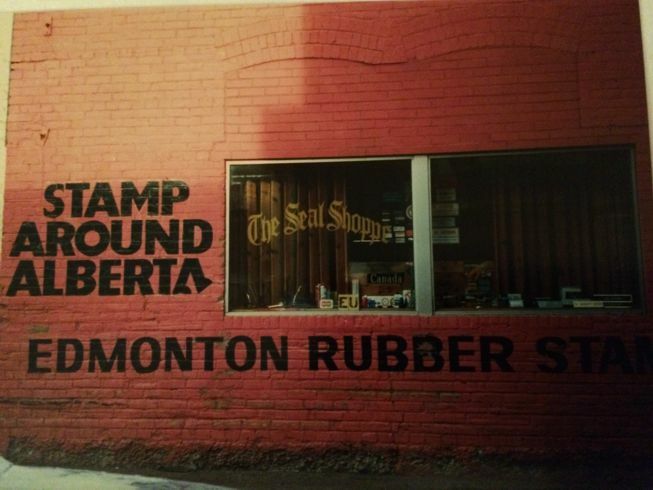 In the early 80's, Royal Rubber Stamp purchased Edmonton Rubber Stamp. This was the shop located in the alley off Jasper Ave. and 102 Street. Notice Scotia Place in the background? Completed in 1983, Scotia Place was only a year old when this photo was taken in 1984! Prior to its current downtown home at 10633-109 st., Royal was located just a couple blocks south at 10557-109 st. In recent years the old shop was home to a music rehearsal studio (Sound Check Rehearsals), but unfortunately now sits empty. Though we're not entirely sure what was printed for the Macdonald Hotel using this die, we know it likely dates back to the 60's. Check out those room prices! Royal opened its first west end location in 1988 when the Seal & Stamp Factory moved west to 10536 - 169 Street. Though no longer at its original location, Royal Rubber Stamp can still be found in the west end at 16608 - 109 Ave.
1974 Toyota Corolla "Stamp" car in front of the old downtown location at 10557 - 109 Street. I hope you've enjoyed this little journey back in time! I'll do another one of these in the future. In the meantime, if you'd like to see more of Royal's history, be sure to follow us on twitter and search the hashtag #royalyeghistory. Posted on July 28, 2014 - 11:06am by Stefan.